I love a great Japanese grill but I find them to be very expensive. The experience of eating at a Hibachi restaurant is amazing though and the food is much simpler than you think to recreate at home, even the Yum Yum sauce. Asian Broccoli Slaw is the perfect recipe for your next potluck or summer gathering. 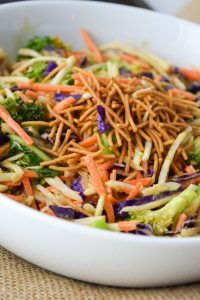 The Broccoli Slaw Dressing has a sweet tangy flavor made from a combination of soy sauce, peanut butter, and ginger.